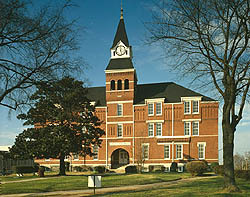 Built in 1882, Stone Hall was the administration building for Atlanta University until 1929. It is a three-story red brick Queen Anne style building with Romanesque Revival elements. The school opened its doors in 1869 on a campus consisting of approximately 50 acres west of downtown. In 1929, Atlanta University united with Morehouse College and Spelman College to form the Atlanta University Center affiliation. Morehouse and Spelman continued to offer undergraduate degrees while Atlanta University became the graduate school for the other two colleges. As part of this affiliation, Atlanta University gave up most of the buildings on its original campus and moved into new quarters with the other two schools. Stone Hall is the building most closely associated with the history of Atlanta University. It primarily functioned as the college's administration building, but it also contained classrooms and meeting rooms. When the colleges merged, Stone Hall was one of the buildings leased to Morris Brown College, which changed the name of the building to Fountain Hall. It is still used as a classroom building. Stone Hall has undergone no exterior alteration since its construction. The interior has seen some changes, including the installation of modern heating, cooling and electrical systems, but the original floor plan remains intact. Stone Hall was designated a National Historic Landmark in 1974. Stone Hall (Fountain Hall) is located on the grounds of Morris Brown College at 643 Martin Luther King, Jr. Dr. Visitors to the campus are welcome. For more information visit the Morris Brown website.